Relationships are like gardens — there is a time to sow, and a time to harvest, propelled always by the shedding of the unnecessary for the vital, the old for the new. This year, I’ve spent a lot of time in gardens. A glimmer of an interest in horticulture began when I first started living in a Delhi barsati with a terrace large enough, I quote a friend, “to play tennis in”. My first winter here in 2015, I filled it with plants picked from a nursery in Mehrauli — rows of areca palms, plenty of ficus, two dwarf champas, pots of star lilies and jasmine. Many did not survive my tending. And the raging summer, that quickly followed, far from helped. On a terrace open to the sky, the basil burned, the jasmine wilted, the golden fern shrivelled. Never mind, I told myself, emptying the pots of their carcasses, I’ll try again. Back to the nursery in September. A month later, a friend sent across her gardener — Suresh, who lived and worked at the conveniently close Indian Institute of Technology (IIT) campus. He was old school and called me “Sir-ji” and he saved my garden. Repotting and pruning, watering and deadheading. That winter was a marvel. But not only because of the plants. I was in a new relationship, and, after so long, one that felt good and easy and right. Around us, the garden conspired to celebrate. Slowly, the pansies unfurled and lasted and lasted longer than expected, their pretty faces nodding to the light. We watched the dahlias and dogflowers, checking every morning, impatient, until they bloomed — miraculously, overnight. In April, it was decided a bamboo shade must be installed on the terrace, for now I knew there was such a thing as too much sun. It kept my plants safe and alive, even if now sheltered from the rain. This March, my partner and I moved in together into a ground-floor apartment, down the road from the barsati (this being important because it meant Suresh could still drop by). Gone was that barsati feeling of being on the same level as treetops, of watching the city from afar, but we had a garden — albeit small and somewhat paved over with cement tiles. But there were narrow flower beds around the edges, with real soil, in which grew a towering curry patta tree, glorious Raat ki rani, and a scattering of humble crotons and pink ixora. By then I’d also started nascently working on a new book, a historical novel in which one of the narrative strands involved the adventures of a woman Victorian botanist. Once we’d settled in, and I’d picked my writing corner, I felt it required botanical adornment. First, bottles of undemanding money plants. Then, more ambitiously, succulents in glass terrariums. On request, friends brought back leaves from New York, South Korea, Uttarkashi, that were framed and hung on the wall. Research took me to London over the summer, where apart from accessing specialist libraries, I also wandered historical gardens — Kew and Chelsea Physic, in particular. Despite the seeming idyll, it wasn’t the easiest of times — I’d been struggling to write, back home it had been difficult for us to find domestic rhythm within our new space. We were suddenly, frequently, at odds. I left Delhi with a sense that everything must be fixed right away. That all must fall into place at once else we were doomed. Except, my walks around gardens taught me otherwise. In there, time slowed down. Mostly because I encountered tangible oldness. Here, from almost three centuries ago, a sprawling Lucombe oak. There, even older, a Japanese pagoda tree. In the newly opened Temperate house in Kew, conocarpodendron saplings from 203-year-old seeds. While in the tropical palm house sat prehistoric Jurassic cycad, collected from the eastern South Africa in the early 1770s, making it allegedly the oldest potted plant in the world. These plants live long lives, anchoring you in your tiny temporality, giving you perspective. Often, I would sit and watch the gardeners. There wasn’t much chatter amongst them, I noticed, each quietly absorbed in their tasks. One particularly industrious leaf-trimmer was hard at work at a tree called Emmenopterys henryi — a Chinese forest specimen that bloomed, I read on the information plaque, once every 30 years. It made me think of how a garden is patience. How much it demands in immediacy when our flowers, shrubs, and trees are always for a time after. Even if we might not be around to enjoy the shade, smell the flowers, harvest the fruit. A garden is in no hurry. It says the present is important, and dismisses our insistence on the forthcoming. Unwilling — because it can’t — to assuage our fears and uncertainties. Yet a garden is also always for the future. 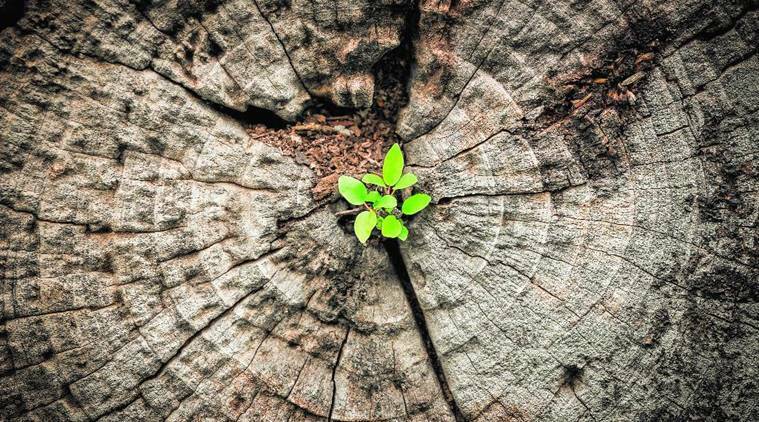 It coaxes us to nurture that most hardy of saplings: hope. That all will come to leaf and bloom at the right season, at the right time. I returned to Delhi in July to find that ground-floor living rather suited our plants. The areca palms, fed by the rain, were suddenly getting taller, the jasmine flourishing in the shade of the curry patta tree, the dwarf champas sprouting shiny new leaves. For them, it was roaring, thriving summer. For my partner and I, still a tough, brittle winter. Still things to thrash out, negotiate, unravel. It was hard work. At times there wasn’t much chatter; we went about our tasks in silence. We pruned. Yet somewhere I was wiser. Or at least more patient. Much more than I’d ever been. Relationships, I realised, like gardens, have their seasons. There is a time to sow, and a time to harvest, propelled always by the shedding of the unnecessary for the vital, the old for the new. Now, as the year ends, I take stock of our garden. All the terrariums, apart from one, are a failure. At least three money plants have had to be replaced. One elegant parlour palm died, besieged by strange termites. The kitchen succulents were over-watered and buried. But we carry on, relentless, clutching our buds of hope into spring.